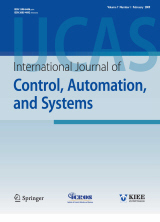 Abstract : "In this paper, a safety-enhanced collaborative control framework is proposed for tele-operated minimally invasive surgery (MIS) using a redundant 7-DoF serial robot. The redundant manipulators offer a safe physical collaborative flexible workspace for nurse or surgeon (assisting physicians, patient support) undergoing surgery. The novel framework integrates a Cartesian compliance control strategy to guarantee that the tele-operated surgical tool always goes through the trocar position, and a safety-enhanced null-space collaborative strategy to constrain the swivel motion in an assumed safe range. Two event-based operative procedures (hands-on motion and teleoperation) are performed in torque level to achieve the whole surgical task. Finally, experimental studies with virtual surgical tasks were conducted to validate the effectiveness of the proposed framework, using the KUKA LWR 4+ robot and Sigma 7 master device. It provided an online flexible and safe collaborative way without degradation of the quality of the surgical task." Keyword : Minimally invasive surgery, redundant robot, safe collaborative null-space strategy, surgical robot teleoperation.